I was at a certain big-box craft store the other day, and I noticed they sell packages of faux chandelier crystals in the vase-filling stuff department (you know, where the glass marbles and seashells are). The package had about 40 crystals for $6, so that’s a great inexpensive alternative if you want to add bling to a chandelier but you don’t have any crystals on hand. Sometimes the dollar store has the same acrylic crystals, but I haven’t seen them around lately. p.s. 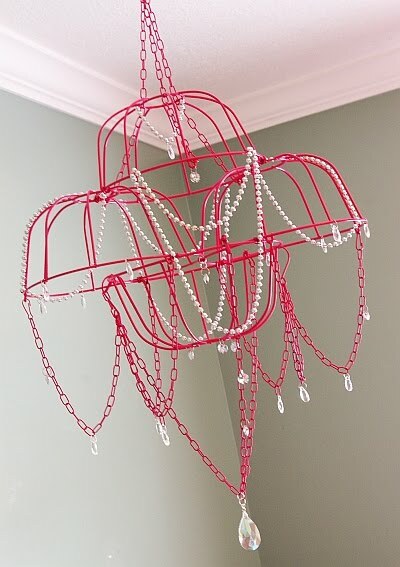 please comment with your links if you have made a cheapster chandelier, too! I’d love to see more that the readers have created! :) have fun!!! OMGosh. I just LOVE LOVE LOVE this!!! How fun!! Yes – that is an awesome project! I hope you are doing well! I LOVE these at home crafty ideas! They are trendy and inexpensive! Thank you for this idea. We are having a Vampire Masquerade Ball for my daughters sweet 16, and I wanted a ball room feel, but not the price. I can make about 4 of these for the party and really add some atmosphere. Thank you very much!!! Love this idea so much! I made one for my breakfast nook and I’ll be working on one for my master bath tomorrow! Where can I post my pix?? @Erin, you have to get the baskets in the springtime – they are seasonal items at the dollar store, unfortunately. Maybe check your local thrift store. I made one of these last week. Actually found the baskets at my local Dollar Tree!!! I could not find the pink that you used, so I switched it up and got a lavender color. It took me three coats to get it to cover completely. Also, the paint chips very easy…I think that it may need to be primed or something prior to spraying with the choice of paint you would like. Mine did not turn out as cute as this one….But I will try again!! I was so inspired by this project that I made two of them! But I’m a bit of a novice in these websites. How do I upload pix of the two pieces I made?? Love this idea for my grand daughter’s room. Stores sell a pendant light with a cord to plug in and this could be used with this chandelier to make a lighted chandelier. I will make one when my Dollar Tree has them in stock and post pics later. Oh my goodness, how fun and creative!